Reminiscent of the bestsellers of Laura Lippman and Harlan Coben --- with a dose of "Big Little Lies" or "Stranger Things" --- IF I DIE TONIGHT is an absorbing, addictive tale of psychological suspense from the author of the highly acclaimed and Edgar Award-nominated WHAT REMAINS OF ME and the USA Today bestselling and Shamus Award-winning Brenna Spector series, in which a seemingly open-and-shut police case with a clear-cut hero and villain turns out to be anything but simple. Late one night in the quiet Hudson Valley town of Havenkill, a distraught woman stumbles into the police station --- and lives are changed forever. 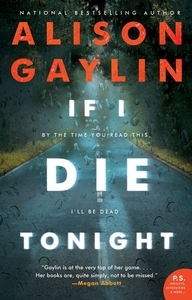 Told from a kaleidoscope of viewpoints --- Wade's mother Jackie, his younger brother Connor, Aimee En, and Pearl Maze, a young police officer with a tragic past, IF I DIE TONIGHT is a story of family ties and dark secrets --- and the lengths we'll go to protect ourselves. - Click here to visit Alison Gaylin's website. - Connect with Alison Gaylin on Facebook, Twitter and Instagram.